The perfect storage solution for your defibrillator, this fully recessed defibrillator wall cabinet is made from thick stainless steel to protect your unit in any environment, and has an alarm and strobe light which will activate when the door is opened, or can be activated with the key provided. 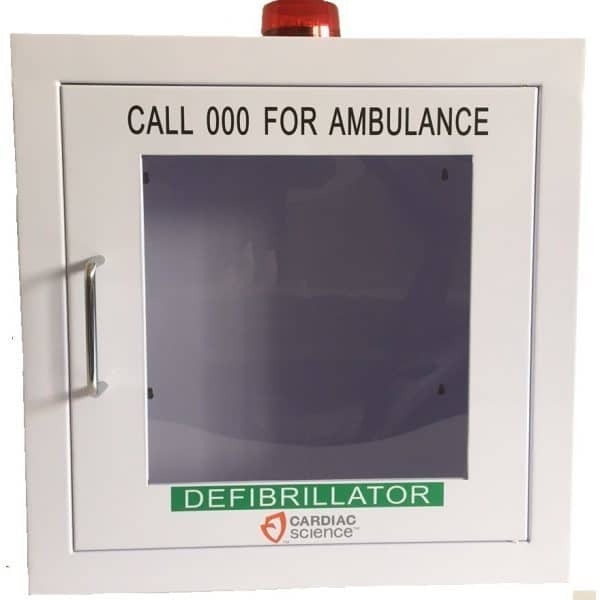 This AED wall mount can hold any Cardiac Science defibrillator with or without a carry case, and the transparent door means that the device is always clearly visible. Bold lettering identifies the defibrillator for anyone responding to a sudden cardiac arrest emergency. Sudden cardiac arrests are stressful, harrowing experiences which can often lead to death. It is important in the face of such a health emergency, to understand why it has occurred and how to react. This background will help any responder to more confidently assist a victim and demonstrates the vital importance of owning a defibrillator. Being such a large purchase, companies may often feel apprehensive about the benefit of such a device, but rest assured, your unit has the ability to save lives! Sudden cardiac arrest can be a silent killer in that you do not have to have a history of heart disease or a heart condition to become a victim. It is estimated that roughly 80% of sudden cardiac arrest deaths are caused by heart disease or a heart condition, however they can also be caused by things such a extreme physical stress, extreme trauma and drug use. This being the case, the data on sudden cardiac arrest deaths is somewhat skewed due to inaccurate reporting. It is important to know that the young and old can suffer a cardiac arrest, because rather than a issue with the physical heart muscle or blocked arteries, a cardiac arrest is caused by the heart’s electrical system malfunctioning and preventing the heart muscle from beating. Without a strong heartbeat, the body’s blood is not pumped to the vital organs, causing oxygen deprivation and meaning that the naturally occurring poisonous products of the body’s metabolism build up in all the cells of the body rather than being cleared away. Without oxygen the brain begins to die within 4-6 minutes of a sudden cardiac arrest collapse. This means that immediate intervention is essential to the survival of the victim. Access to equipment is a crucial part of the response to such a health emergency. A rough guideline is that your defibrillator should take no more than 90 seconds at a quick walk to locate from any area of a building in which it is located. Every minute that goes by without intervention of a sudden cardiac arrest in the form of defibrillation, a victim’s chance of survival decreases by 10%. Your defibrillator will allow you to provide electrical pulses to the body that will help jolt the heart back into a regular rhythm and get oxygen flowing back to the brain, halting the breakdown of the victim’s body. This AED wall mount cabinet allows you to effectively store your defibrillator without it getting in the way or being located in a drawer or cupboard where it may be forgotten or missed by someone searching for it. The ability to wire the alarm and flashing light to your security system means that everyone in the building can be alerted to an emergency, increasing the chance of early professional assistance being provided. It is easy to use and will keep your unit safe and protected from the outside environment, so that it is always ready to operate when you need it.